Yesterday Fairfax published an unlikely article by columnist and occasional Catholic Joel Meares. It was titled 'Growing up gay, Catholic school was a haven for me'. He was thanking the lay teachers at his Catholic school for 'nurturing [his] difference'. With some degree of understatement, he then acknowledged that his story was not everybody's story. This reminded me of the blog I wrote last month in which I mentioned my personal recollection from 1980s of 'a retired Jesuit preparatory school principal boasting of "sending out" his students to bully peers who were homosexual'. 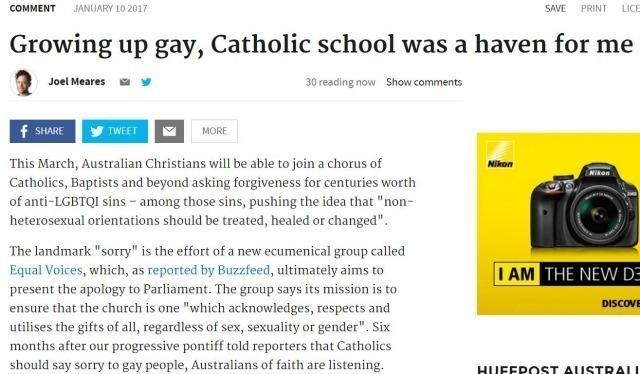 I put that in the context of a Fairfax report from 2015 that revealed the Catholic Archbishop of Melbourne Denis Hart had buried a 2007 report aimed at protecting LGBTQI students in Catholic schools from homophobic bullying. I don't live in Melbourne and I've only met Archbishop Hart once or twice, but I've heard him characterised as a doctrinal hardliner who is capable of empathy with marginal Catholics. This is obviously not true of all clerics. Fairly or unfairly, Hart's erstwhile colleague Cardinal George Pell is often regarded as a narcissistic hardliner not capable of showing empathy to marginal Catholics. Pope Francis has famously shown signs that he wants to 'include' LGBTIQ and other marginal Catholics in the life of the Church. That's what he was about when he proclaimed 2016 the 'Year of Mercy'. But he's also made it plain that he does not intend to change the doctrine. In other words, the lives of LGBTIQ Catholics will still be 'objectively disordered' in the eyes of Catholic doctrine. But in practice, he wants LGBTIQ Catholics to be encouraged and affirmed, as Joel Meares was in his Catholic school. Understandably many angry LGBTIQ ex-Catholics are not impressed by this wondrous contradiction. They ask why the Church's doctrine cannot be brought into line with its pastoral practice. They will have nothing to do with the Church until it is, and they will be waiting a long time. My answer to them is that they should allow themselves to enjoy the blessed duality that is the Catholic Church. The supportive 'haven' Meares' Catholic school was for him as he grew up. Let the actions of the Church's quiet pastoral achievers hold sway over its loud clerics and the declining relevance of particular sections of doctrine.